John Smith (?1655-1723), eminent Whig politician under William III and Queen Anne, was the son of John Smith of South Tidworth or Tedworth, Hampshire, and heir to 'a good estate'. He matriculated from St John's College, Oxford, in 1672 but did not take a degree. He was admitted a student to the Middle Temple in 1674 but was not called to the bar. His status as the son and heir of a prominent landowner made politics a natural career choice, and he served as a Member of Parliament for Ludgershall, Wiltshire, 1678-9, 1680-1 and 1688-9, Bere Alston, Devon, 1691-5, for Andover, Hampshire, 1695-1713, and East Looe, Cornwall, from 1715 until his death on 2 October 1723, some three weeks before that of the painter of this portrait, Kneller. He was known as a good orator and conversationalist with firmly-held opinions. Although a staunch Whig and Protestant, his agreeable disposition enabled him to remain on good terms with the Tories. He was the leading whip for the Whigs before becoming a Lord of the Treasury, 1694-99, and Chancellor of the Exchequer, 1699-1701. On 24 October 1705 Smith was elected Speaker of the House of Commons, beating William Bromley by forty-three votes. In 1706 he was made one of the Commissioners for arranging the Union with Scotland, a task he performed so successfully that when the House assembled in October 1707 with the addition of the new Scottish members, he was re-elected Speaker without a contest. It is presumably this rare tribute which is commemorated in this picture, in which Smith is shown holding a scroll inscribed 'The Union Act' (the Act had received the royal assent on 6 March 1707). In April 1708 he resigned the post in favour of his political ally Sir Richard Onslow and returned to the chancellorship of the Exchequer until August 1710, when he retired from high-level politics with the lucrative sinecure of one of the four principal tellers of the Exchequer, which he retained until his death. Kneller's portrait shows him in the full dignity of the Speaker's robes, with the Speaker's mace and chair behind him. The fluted pillars on either side of the chair correspond with its actual appearance at the time and can be seen in other contemporary paintings such as Arthur Onslow in the House of Commons, 1730, by Sir James Thornhill and William Hogarth, at Clandon Park. The chair was designed by Sir Christopher Wren in 1706 and copies of it were used until 1834. The painting, in which the splendid accoutrements of office are handled with restrained but well-balanced grace, concentrating all attention on the sensitively painted head and hand, is a particularly fine example of official portraiture at the time of Queen Anne and of Kneller's work in the grand style at its most dignified. Thomas Assheton-Smith (died 1828), a descendant of the sitter, presented a copy of this painting to the Palace of Westminster in 1803. John Smith (?1655–1725) was an eminent Whig politician who commanded much respect as a commissioner for arranging the union with Scotland. In 1707 he was re-elected as Speaker of the House of Commons. Kneller shows him in his Speaker’s robes, the mace and chair behind him, holding a scroll inscribed ‘The Union Act’. The composition is one of dignified regularity, the sweep of Smith’s robe deliberately following the vertical black lines on the marble floor. German-born, Kneller was the most successful and prolific portraitist of his day. Principal Painter from 1688, he was created a baronet in 1715. John Smith (?1655-1723), eminent Whig politician under William III and Queen Anne, was the son of John Smith of South Tidworth or Tedworth, Hants., and heir to 'a good estate'. He matriculated from St John's College, Oxford, in 1672 and was admitted a student to the Middle Temple in 1674 but chose to go into politics, becoming MP for Ludgershall, Wilts., 1678-9, 1680-1 and 1688-9, Bere Alston, Devon, 1691-5, for Andover, Hampshire, 1695-1713, and East Looe, Cornwall, from 1715 until his death on 2 October 1723, some three weeks before that of the painter of this portrait, Kneller. Smith was a good orator and conversationalist, and is said to have had an agreeable personality that enabled him to remain on good terms with the Tories despite his own lifelong unswerving commitment to the Whig and Protestant causes. He ably filled several government posts including that of Chancellor of the Exchequer 1699-1701, and was elected Speaker of the House of Commons on 24 October 1705. In 1706 he was made one of the Commissioners for arranging the union with Scotland, a task he performed so successfully that when the House assembled in October 1707 with the addition of the new Scottish members, he was re-elected Speaker without a contest. It is presumably this rare tribute which is commemorated in this picture, in which Smith is shown holding a scroll inscribed 'The Union Act' (the Act had received the royal assent on 6 March 1707). In April 1708 he resigned the post in favour of his political ally Sir Richard Onslow and returned to the chancellorship of the Exchequer until August 1710, when he retired from high-level politics with the lucrative sinecure of one of the four principal tellers of the Exchequer, which he retained until his death. In 1683 he had married Anne, daughter of Sir Thomas Strickland, MP, of Boynton, Yorks., by whom he had four sons and three daughters. 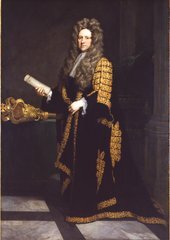 Kneller's portrait shows him in the full dignity of the Speaker's robes, with the Speaker's mace and chair behind him. The fluted pillars on either side of the chair correspond with its actual appearance at the time and can be seen in other contemporary paintings such as 'Arthur Onslow in the House of Commons', 1730, by Sir James Thornhill and William Hogarth, at Clandon Park (repr. John Kerslake, National Portrait Gallery: Early Georgian Portraits, 1977, II, fig.580). According to Walker (1960), Speaker Smith's chair was designed by Sir Christopher Wren in 1706 and copies of it were used until 1834. Thomas Assheton-Smith (died 1828), a descendant of the sitter, presented a copy of this painting to the Palace of Westminster in 1803. According to Walker (1960), what appears to be this original was first recorded with another descendant, Lt Col. Ronald Francis Assheton Sloane-Stanley (1867-1948) of The Bay House, Alverstoke, Hants., whence it presumably passed to his kinsman Sir Michael Duff (formerly Duff-Assheton-Smith) some time before 1954.